CheapTickets.com (part of Orbitz group), offers a 15% hotel promo code for stays until 30 June 2013 (when booked until 6 April 2013). The discount is to be applied in the final page of the reservation process, just above the credit card information, in the "Promotion code" field. For bookings until 1 April 2013 (stays throughout 2013), Hotels4U (Thomas Cook group), offers a 10% discount on all hotels. The offer is valid at the Rilano Resort Steinplatte in Tyrol, Austria, close to the German border. The deal includes free breakfast and access to the spa facilities. Valid for most of the days of April, May and June 2013. Bookings must be made until 31 March 2013. The deal is valid on the German website of HRS. However, on the very top of the window that opens, you can easily switch the language to English (look for the country flag on the very top of the window). As an example, 2 nights over the week-end 8-10 June 2013 have a total price of 139€, while the same room costs 318€ on booking.com (more than double). Hotels4U (part of Thomas Cook group) offers a 30% discount for all-inclusive holidays at the Melia Sharm Resort and Spa, for reservations and stays until 31 October 2013. For example, one week all-inclusive during the period 6 - 13 July 2013 costs £459 - that´s more than 30% discount when compared to the £683 charged by booking.com. Similar to lastminute.com's TopSecret Hotels or Priceline's Express Deals, Expedia also offers large discounts on hotels whose names you find out only after making the reservation. There are 3 hotels shown by booking.com: Welness Hotel Step, Hotel Duo and Clarion Congress Hotel Prague. Using the additional information that internet is free and a golf course is nearby, we came to the conclusion that the Secret Saver Hotel is Clarion Congress Hotel Prague. As a tip, take into account the elements that differentiate the most the short listed hotels (like the golf nearby in our case). Also, check out the Expedia description of the short listed hotels, as if you were performing your regular search, when you could see the names of the hotels. Thus, with Expedia Secret Saver Hotels you buy 2 nights at the Clarion for 111£, while the same room on booking.com costs 205£ (almost double). The 2013 "Superbowl of Rodeos" will take place between 5 and 14 December at the Thomas and Mack Center on the campus of the University of Nevada, Las Vegas. - 2 complimentary admission tickets to Tabu nightclub (80$ value). The promotion is valid for stays between November 24 and December 20, 2013. We test tried the deal for 5 nights (4 to 9 December 2013). The total price booked directly at MGM Grand using the link above was of 448$ for a Grand Premier View King Room (adding the nightly 25$ nightly resort fee, that adds up to a total of 573$ for 5 nights). Considering the 150$ complimentary food, drinks and entertainment, your net cost is 423$ (or 85$ per night). The same room costs 654$ (or 131$ per night) from booking.com. 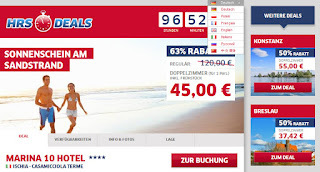 ANIMOD is a German based hotel discounter - they also have the English version of their website. Currently, they sell double rooms at the Best Western Hotel President**** for 120€ for 2 nights, breakfast included (60€ per night). You also have the option of buying 3 nights for a total of 170€. For example, 2 nights over the week-end 17-19 May 2013 will cost 120€ from ANIMOD, that is a 50% discount from the 240€ charged by booking.com. 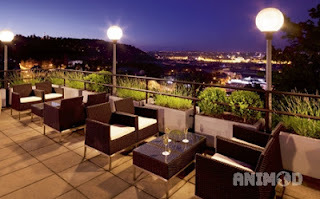 Situated in the middle of the Castle district, offering great of Budapest. The quality of products at breakfast could be improved. If arriving by car, you have to take a parking ticket to enter the Castle district (which is closed by barriers). However, when checking out, ask the receptionist to validate your ticket and you do not have to pay for the parking at the barrier, on your way out. Days Inn is the sister brand of Ramada and includes approximately 50 properties mainly in the UK and Germany. For bookings until 10 April 2013, they offer the special rate of 50£ for 2-night stays until 31 May 2013. The rates are non-refundable, so make the booking only when sure of your trip dates. That translates into a 33% discount off the standard rate for 3-nights stays, valid for stays between 27 March and 31 May 2013 (when booked until 16 April 2013). 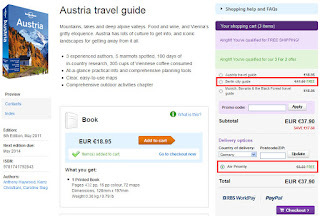 In practice, the discount you will get will be about 25% when compared to the usual online travel agencies. 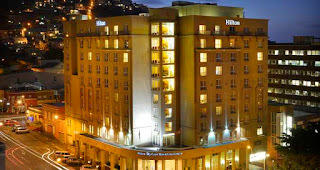 We test-tried the deal: 3 nights during the extended weekend 4 - 7 April 2013 at the Novotel Lisboa, in Lisbon, Portugal have a total price of 140€. 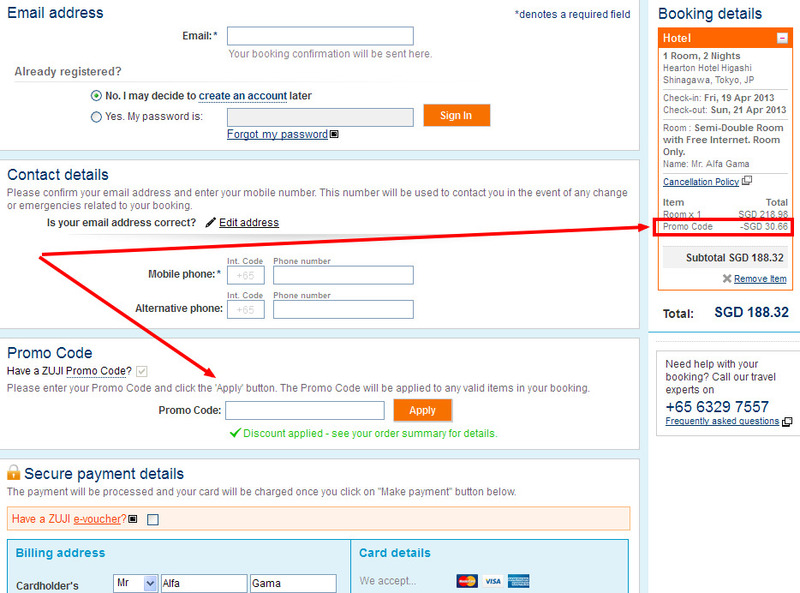 That is a 25% discount from the 189€ charged by booking.com. The reservations with this offer must be made at least 5 days in advance and cannot be cancelled, so book only if you are sure of your trip dates. While some may be out of reach, others are worth giving a try the next time you have a long-haul flight. Spring clearance on worldwide cruises from Priceline. Various offers for bookings until 31 March 2013, for journeys throughout 2013. A 10% hotel voucher code is available at Expedia France for all reservations made until March 21, 2013, with hotel stays until September 15, 2013. The discount is applicable to the Expedia rates ("Offre Expedia" in the French version), excluding taxes and fees. To take advantage of the deal, follow this link to their website, proceed to the reservation as usual, and in the payment window, in the section promotion code (above the credit card information) type in the code EXPHOTELMAR13FR. The discount is applicable only on the French version of Expedia, so it is important to follow this link to benefit from the discount (do not go to Expedia.com, because it will not work). If you do not understand French, either use an automatic translator (like Google Chrome has, or open the English and French versions at the same time and make the reservation in parallel, but make the final selection and payment in the French version, to be able to use the hotel promo code). Offer valid when booked before April 9, 2013 (with stays until December 29, 2013). When we checked the deal, 5-night stays for the period 10-15 July 2013 had a total price from MGM of 657$ (including the resort fee). The same standard double room costs 707$ from booking.com. That means MGM offers you 50$ discount on room (7% saving on room rate) plus 75$ food and beverage credit. Zuji Singapore (part of Travelocity group), offers a 14% discount on all Japan hotels, for reservations made until 25 March 2013 (travel throughout 2013). Offer valid for a minimum of two night stays until 31 May 2013. 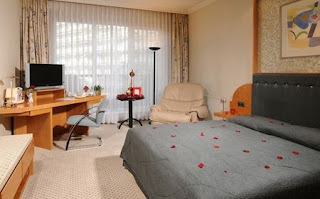 As an example: 2 nights in a deluxe king room during the weekend 17 - 19 May 2013 at the Ramada Plaza Antwerp, Belgium cost 119€, which is a 35% discount compared to the 178€ charged by booking.com. UPDATE: the promo code has expired. Check out the active codes on the right side of this page, in the column "CURRENT DISCOUNTS"
We found a 13% promo code valid for hotel stays throughout 2013. Offer valid at the Marina H10 Boutique and Design Hotel**** Casamicciola Terme, Ischia in the gulf of Naples, for stays throughout April, May and the first part of June 2013. To be booked by 16 March 2013. You pay only 45€ for a double room, breakfast included. 2 nights over the last weekend in May 2013 have a total price of 90€, breakfast included. The same room costs 230€ from booking.com. Special offer on bed and breakfast rates from Hilton Resorts in Europe, Asia Pacific, South-East Asia, Middle East. Valid for reservations until May 14, 2013 for stays between March 14 and December 31, 2013 (30 days advance booking required). The rates are non-refundable, so make the reservations only when you are sure of your travel dates. EasyClickTravel is an online distributor of discounted hotel rooms. They currently offer a 30$ promo code for all hotel reservations booked until 31 May 2013, with stays throughout 2013 (minimum 350$ purchase required). 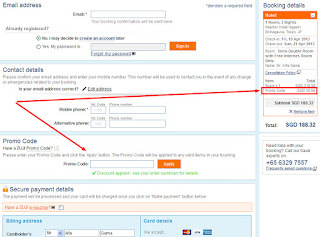 That means that EasyClickTravel provides a 15% discount compared to the 403$ charged by booking.com. ebookers.com (part of Orbitz group) offers a limited time 15% discount code (for travel until 31 August 2013) . Reservations have already started for the flights with British Airways on the largest commercial airplane in the world. - London to Hong Kong, from £559 return, for flights starting with 15 November 2013. Luxor Hotel and Casino, the pyramid shaped resort on the Las Vegas Strip, has a special all-inclusive offer until 30 October 2013 (meals and entertainment included). For example, 4 nights (16-20 May 2013) for 2 persons in the Tower deluxe king room have a total price of 1 237$ for the all-inclusive package. Room only from booking.com costs 677$. - admission to LAX nightclub costs 30$ per person per night, and, for 2 people for 3 nights, that's 180$. TOTAL: 947$ (that's a 40% discount considering that you only pay 560$ for that value). The best thing about all this is that you keep your budget under control and still enjoy the full Vegas experience. For bookings made this week you get 10% discount on car hire in UK and Ireland (pick up period until 30 April 2013, a minimum 3 day rental required). 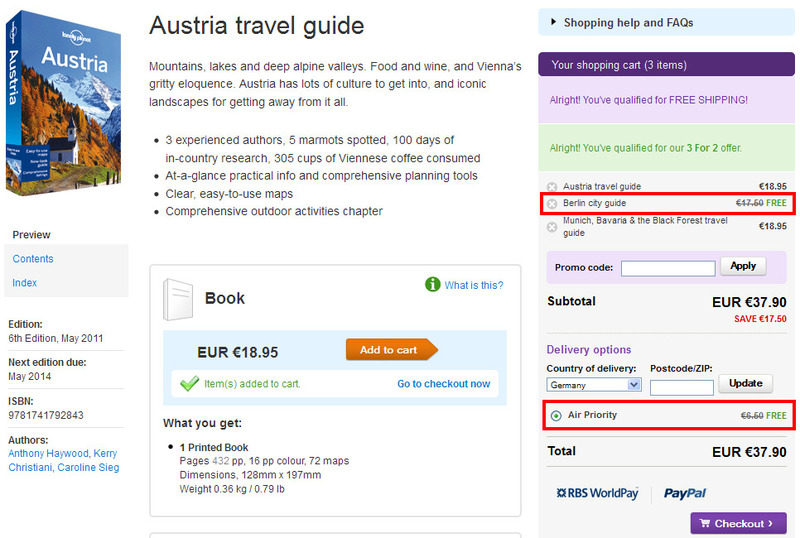 Current promotion from Lonely Planet, whereby you only pay for 2 out of 3 guides purchased. In addition, you get free shipping for for purchases over 25£, 35€ or 40$. Currently, they sell double rooms at the NH Prague**** for 100€ for 2 nights, breakfast included (50€ per night). For example, 2 nights over the week-end 17-19 May 2013 will cost 100€ from ANIMOD, that is a 40% discount from the 178€ charged by booking.com. For bookings until the end of this weekend (stays throughout 2013), Hotels4U (Thomas Cook group), offer a 10% discount on all hotels. We test tried the deal for 5 nights (4 to 9 December 2013). The total price booked directly at MGM Grand using the link above was of 560$ for a deluxe suite (adding the nightly 25$ nightly resort fee, that adds up to a total of 685$ for 5 nights). Considering the 150$ complimentary food, drinks and entertainment, your net cost is 535$ (or 107$ per night). The same suite costs 822$ (or 164$ per night) from booking.com. For bookings until 10 March 2013, you can find rooms for only £25 per night (valid for stays between 27 March and 23 May 2013). - Glasgow East Kilbride Central (12, 17 May 2013), etc.